Tamasin Cave of Spinwatch exposes the cosy links between Tesco and the planning minister Bob Neill, given the government’s planning reforms in favour of development. The week before the government published its controversial reforms to England’s planning system, Conservative planning minister, Bob Neill, was snapped looking relaxed, glass of wine in hand, at a Westminster party. The occasion is the invitation-only summer get-together of lobbying firm Hanover, run by Charles Lewington, John Major’s former press secretary. 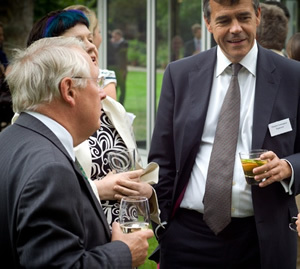 Neill is pictured with Lewington, and on his shoulder is Lucy Neville-Rolfe, chief lobbyist at Tesco. Tesco will be a big winner under the new planning system with its presumption in favour of development. The supermarket’s lobbying campaign continues at this week’s Conservative party conference, where last night it was the sole sponsor of the Conservative Councillors’ Association reception. The CCA represents nearly all local Tory politicians. A useful connection, one imagines, given their role in planning decisions. Minister Bob Neill also has a busy conference schedule. Today sees him discuss the planning reforms with Conservative councillor and CCA board member, Gary Porter, one of four experts who helped write the Draft National Planning Policy Framework. The event is hosted by Savills, one of Britain’s biggest property brokers. Given the access the supermarkets, house builders, developers and their representatives have to ministers like Neill, and the sustained, well-resourced lobbying they have been engaged in to push the reforms through, it’s hardly a fair fight. You seem to be saying that there is a problem that more homes should be built – but you must be aware that too few homes are built in Britain every year. If the housing developers (so-called, since they develop so little)are guilty of something it is failing to build. Britain’s problem with homelessness, overcrowding, climbing rents and house prices are all symptomatic of a shocking shortfall in the number of new homes built each year, for the last fifteen years at least. If only there were a ‘presumption in favour of development’! What would you prefer, a presumption in favour of homelessness?